ASEAN and North Korea: Strange Bedfellows? North Korea asked ASEAN to take its side against the United States. Tensions have been thick in the Korean peninsula over the last couple of months, ever since the initiation of the deployment of the U.S. Terminal High Altitude Area Defense (THAAD) anti-ballistic missile system in South Korea. There have been hostile statements from both North Korea and the United States, even threatening military action. These statements have been further backed by U.S. naval buildup in the region and hurried missile tests from North Korea. While these developments are not particularly odd — tensions between the Koreas have their ebbs and flows and flare up with fair regularity — it is odd that North Korea asked for ASEAN’s support against the United States and South Korea. North Korea’s relations with ASEAN have not been bad as one might assume. Indeed, the popular image of North Korea as a reclusive country — the “hermit kingdom” — with little diplomatic interaction with the rest of the world is, to large extent, misplaced. North Korea has diplomatic relations with 164 UN member states, along with Palestine, the Sahrawi Arab Democratic Republic, and the European Union. (Israel, by comparison, has diplomatic ties with 159 countries). Thus, the plea by North Korea to ASEAN need not necessarily be received with raised eyebrows, as has been the case. This is not to say that ASEAN-North Korea relations are flourishing, but a diplomatic request for support to ASEAN, all of whose members have long had diplomatic ties with North Korea, is not outlandish. Despite all of the above, one would be hard-pressed to label ASEAN-North Korea relations, at least at the level of the organization, anything more than perfunctory. The level of the relationship has not progressed beyond membership of the ARF and accession to the TAC. In contrast, South Korea became a sectoral dialogue partner in 1989, a full dialogue partner in 1991, and started a summit-level relationship with ASEAN in 1997. North Korea has also been left out of the range of ASEAN-led initiatives that have sprouted in the last decade or so, such as the East Asia Summit (EAS) and the Regional Comprehensive Economic Partnership (RCEP) — all of which, importantly, South Korea is an intrinsic part of. North Korea’s choice to approach ASEAN to seek support against the United States is thus counterintuitive, to say the least. ASEAN has since its formation in 1967 been criticized as being beholden to the United States and U.S. interests in Southeast Asia. ASEAN’s early years of fighting communist insurgencies within the member states’ borders did much to provide fodder to this line of argument. Further, the strong relations of the Philippines and Thailand with the United States buttressed this stance. However, there is a fair consensus among scholars of ASEAN and Southeast Asia that U.S. influence over and importance to ASEAN is exaggerated. 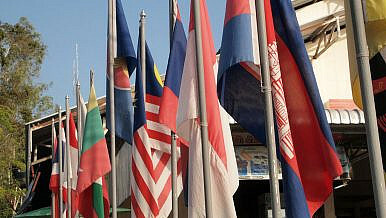 ASEAN moved to establish the Zone of Peace, Friendship, and Neutrality (ZOPFAN) in as early as 1971. While neutrality may not form a core principle of the “ASEAN way” in the full sense of the term, ASEAN’s practice of a non-interfering (and neutral) stance on most international matters (in addition to internal matters) is one of the reasons for its continued survival. Yet, the very existence of the perception of an U.S. tilt, if only from some quarters, should serve to dispel any notions of ASEAN diplomatic support for North Korea. The North Korean request also seems strange as it comes in the wake of a major diplomatic and political row with Malaysia over the death of Kim Jong-nam, half-brother of the North Korean leader. Arguments that ascribe ASEAN’s “neutrality” to a “fear of upsetting North Korea” are likely far-fetched. Rather, this sort of reaction is exactly what one would expect from ASEAN given its unflinching adherence to the ASEAN way even on international issues, manifest most prominently in the South China Sea crisis. This style of broad and general statements with no action is not necessarily a shortcoming of ASEAN, although most critics view it as such. The 30th ASEAN Summit, held in Manila last week, ASEAN witnessed the usual biannual flurry of activity on a wide range of matters. This summit primarily dealt with issues pertaining to ASEAN itself, however. The 31st Summit, to be held later this year in November, will include the “related meetings” focusing on ASEAN’s external relations. It would be optimistic to expect any reciprocation on the part of ASEAN to North Korea’s appeal, just as the appeal itself was an optimistic endeavor from North Korea. Indeed, ASEAN Secretary General Le Luong Minh has already indicated that ASEAN’s position on the Korean crisis is “clear and consistent,” and will not deviate from the past. Were they to cooperate substantively on any matter, ASEAN and North Korea would make strange bedfellows. For the time being, it looks as if it will be business as usual. Sahil Mathur is an MPhil student at the Center for International Politics, Organization, and Disarmament, School of International Studies, Jawaharlal Nehru University.